CENTRAL SQUARE – The annual Stuff-A-Bus program was held in conjunction with the Central Square Teachers’ Association and the United Way of Greater Oswego County. This year’s event was an even bigger success, providing school supplies to more than 139 Central Square School District students. 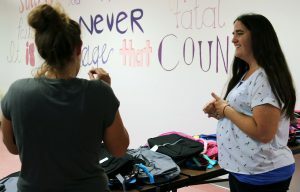 District staff volunteer Sarah Henderson helps a parent check as many items off her children’s school supply list as possible. Overall, the annual Stuff-A-Bus distribution event in Central Square helped 139 students. Staff and community members collected notebooks, pencils, pens, erasers, highlighters, folders, binders, backpacks, crayons and markers, among other supplies for distribution. On August 17, these supplies stuffed an entire school bus at the Central Square Wal-Mart for local distribution. On August 21, the supplies were available for parents and students in the cafeteria of Paul V. Moore High School. Parents were able to bring classroom supply lists to the event, and district staff was on hand to help them complete their lists. In addition, each school received a box of assorted left-over supplies that will benefit even more students throughout the school year. The district was honored to help local families in need of the supplies, and the smiles and excitement from students when they received a new backpack, notebook or other much needed items was inspiring. Contact the United Way of Greater Oswego County for further details about this program.